Long before digital watches began synthetically beeping at their owners to signal a pre-set time, there existed classic mechanical timepieces that actually chimed an alarm. Many brands made alarm watches back in the day, with Seiko being one of the largest. 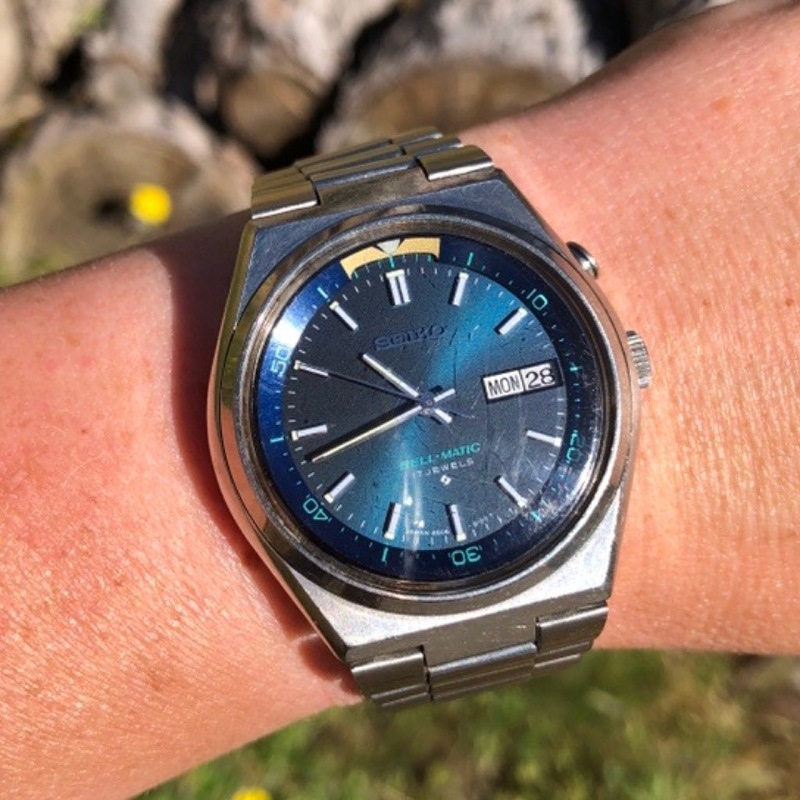 If you follow @perpetualgirl or me (@ranchracer) on Instagram, you may know that she has a propensity for vintage watches, whereas I tend to prefer the latest shiny new pieces. 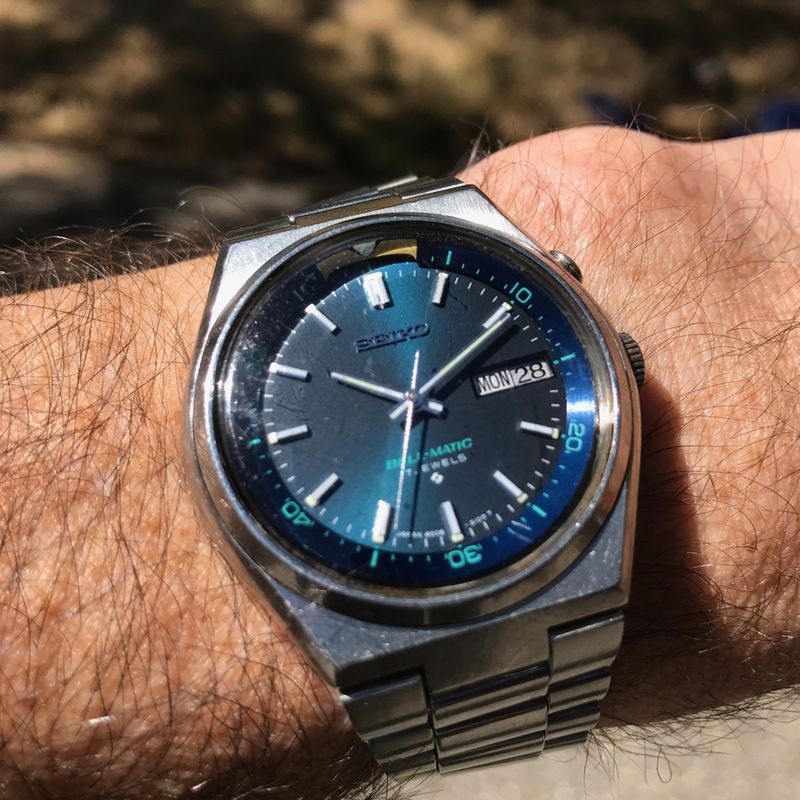 In this case I have to concede that Perpetual Girl was spot on when she picked up this near-perfect example of a blue dial Seiko Bell-Matic 4006-6089, Let’s take a closer look. The history of the Bell-Matic appears to begin in Seiko’s home country of Japan with the reference 4006-7000 in 1966. The 27-jewel movement was the first mechanical alarm watch to feature an automatic winding rotor. 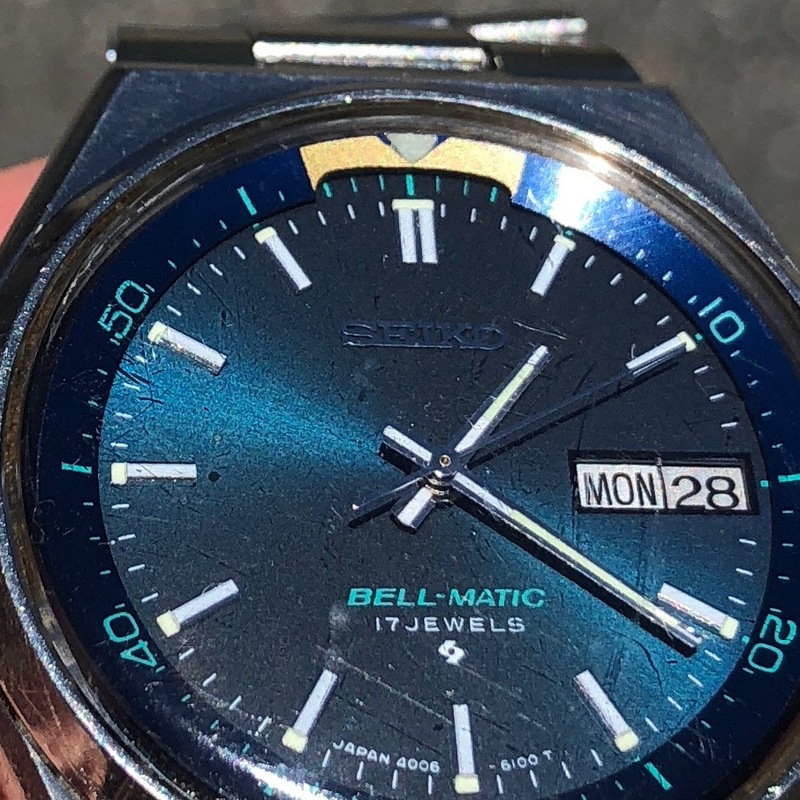 Because of excessive US import tariffs on watches with more than 17 jewels, the jewel count of the Bell-Matic progressively decreased until 1969 when that magic 17 was attained and Bell-Matics began arriving on US shores. This particular reference 4006-6089 was manufactured in either 1970, 72, or 74. 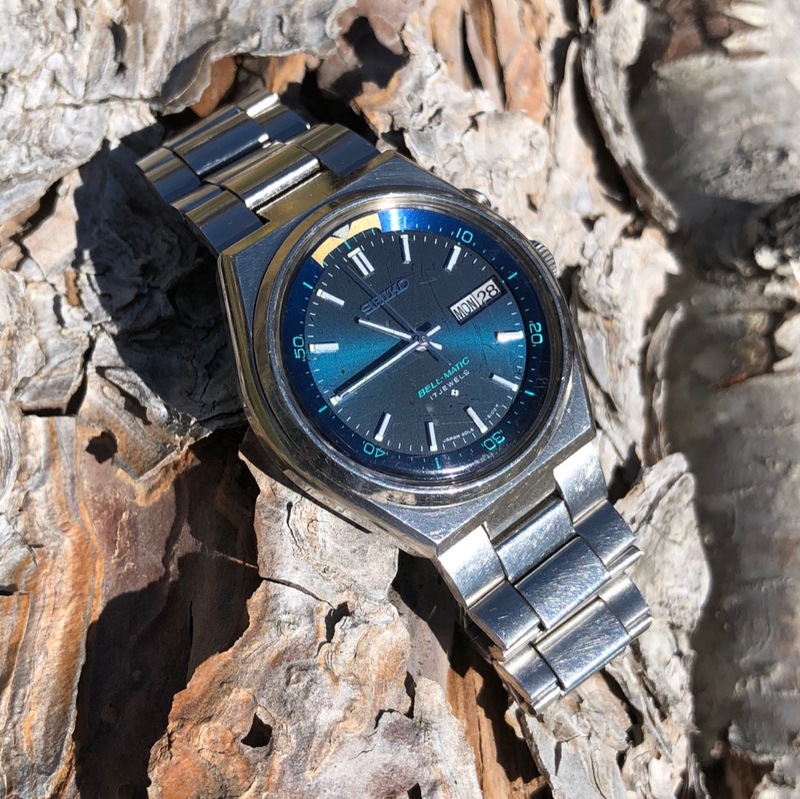 The stainless steel case measures 38mm in diameter and just over 13mm thick, while the proprietary 23mm three-link bracelet tapers to a svelte 16mm. Not all Bell-Matic references have proprietary bracelets, which can make strap swaps nigh on impossible. 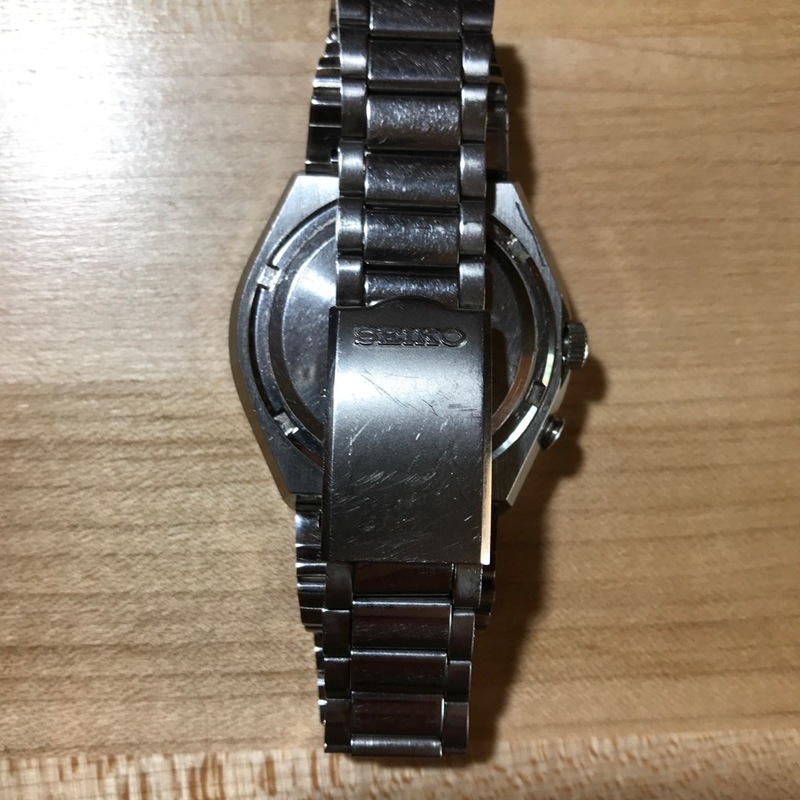 In this case the original bracelet on our 6089 is in beautiful condition, so it’s not something we’ll worry much about, especially considering how great it looks on the bracelet. Looking great on Perpetual Girl’s wrist! Still big enough for Ranch Racer’s wrist. The dark blue dial comes alive in the bright sun. It’s really stunning. Polished and applied stick markers live at each 5-minute interval (with a double marker at high noon/midnight), separated by five white-painted minute/seconds hash marks. A small section at the tip of each applied marker is filled with lume. 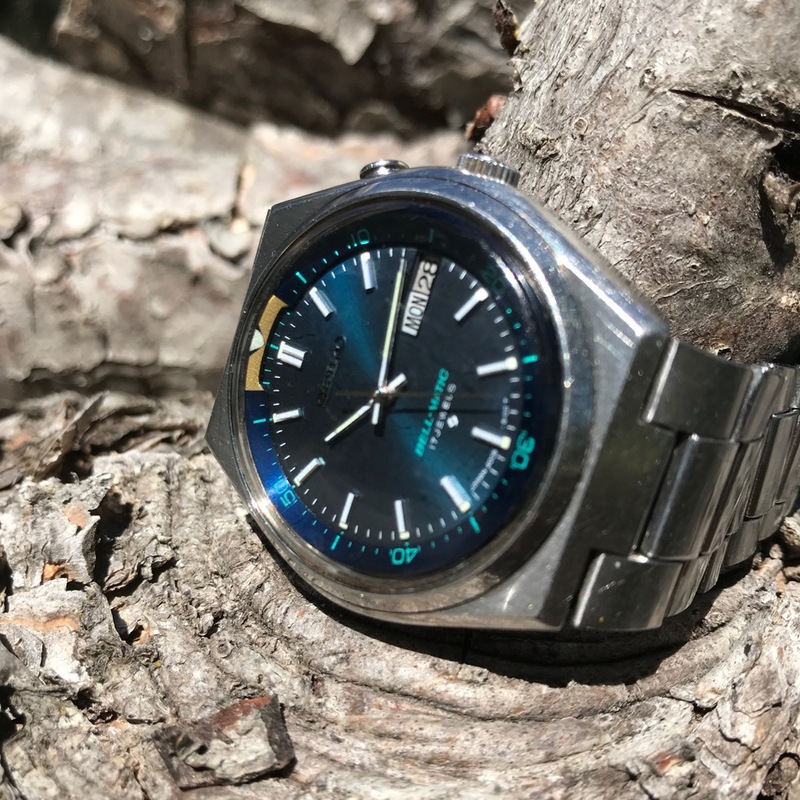 All three hands are straight-forward polished sticks (hour and minute are lumed), and there’s an applied and polished “SEIKO” just under 12 o’clock. Above the 6 o’clock marker we find “BELL-MATIC” text in a contrasting light blue with “17 JEWELS” in white just underneath. Sitting below that is a stylized “S” logo. An acrylic crystal covers the works. Where the Bell-Matic really starts to set itself apart from standard three-handers is in the internal rotating, alarm-setting bezel. The 60-minute bezel on this particular reference is color-matched to the main dial and includes light blue numerals and small minute hash marks. At the 0/60-minute mark we find a white inward-facing triangle set into a gold bar, under which that particular section of the bezel is cut out. The bar spans a sixty minute time period. How do I know this? Because, underneath the bezel is a chapter ring with another timescale. This particular scale, also printed in blue, is a 12-hour scale with five smaller hashes separating each larger hash marking the hours. This layout represents 12-hours, each separated into six 10-minute graduations. So how does this thing work? Pulling the crown out to the first stop and rotating it backwards sets the bezel in motion counterclockwise. As the bezel rotates, the cut-out below the gold bar regressively reveals 1-hour sections on the lower chapter ring. The arrow at the center of the gold bar indicates the currently selected alarm time. So for example, if the arrow is pointing to the first 10-minute hash mark on the alarm scale just left of 12 o’clock, the alarm is now set for 11:50. Make sense? The non-hacking, non-manual-winding movement’s mainspring is wound only by the motion of the rotor, while a separate spring powering the alarm is manually wound with the crown set to its fully-inward position. About twelve turns is all it takes to fully wind the alarm spring. Now that we’ve set our alarm time and wound the spring, the final step is to pull out the arming button at 2 o’clock. The alarm is now set and armed and will ring at the pre-selected time. It rings for about 10 seconds, or can be manually shut off by pushing the arming button back in. I have yet to dig into one of these movements, but it sounds like the alarm spring powers a small hammer that hits a tiny bell. It’s very quaint by today’s standards, and actually quite charming. See the video above to get a listen. Pull the crown out to position two and you’re now in time-setting mode. Spinning the hands clockwise also advances the non-quickset day every 24 hours. Something a bit odd is the way you set the date. While I would expect that turning the crown clockwise in position one would accomplish this task, I would be wrong. The alarm arming button at 2 o’clock serves a second purpose. Pushing it in actually advances the date one day at a time. The date also advances with the day every 24 hours while advancing the main hands through 12:00am. Once you’ve played around with it for a bit, the entire system actually becomes quite intuitive. Weighing in at only 101 grams, the Bell-Matic is a very comfortable all-day watch. The original stainless steel bracelet feels great, and at 38mm it fits most wrists (see wrist shot of Perpetual Girl). More than once I’ve glanced down at it and thought I was wearing my similarly sized and colored Rolex Oyster Perpetual! 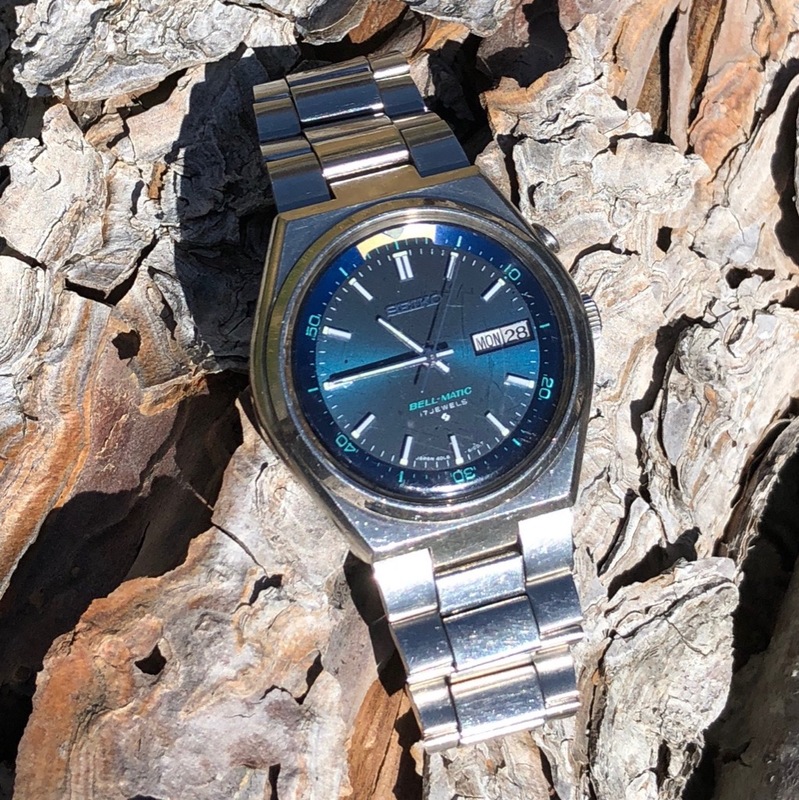 The Seiko Bell-Matic has been such a fun addition to our growing collection. The alarm obviously gets all kinds of attention when it sounds off in public, and it’s just a comfortable and enjoyable everyday watch. 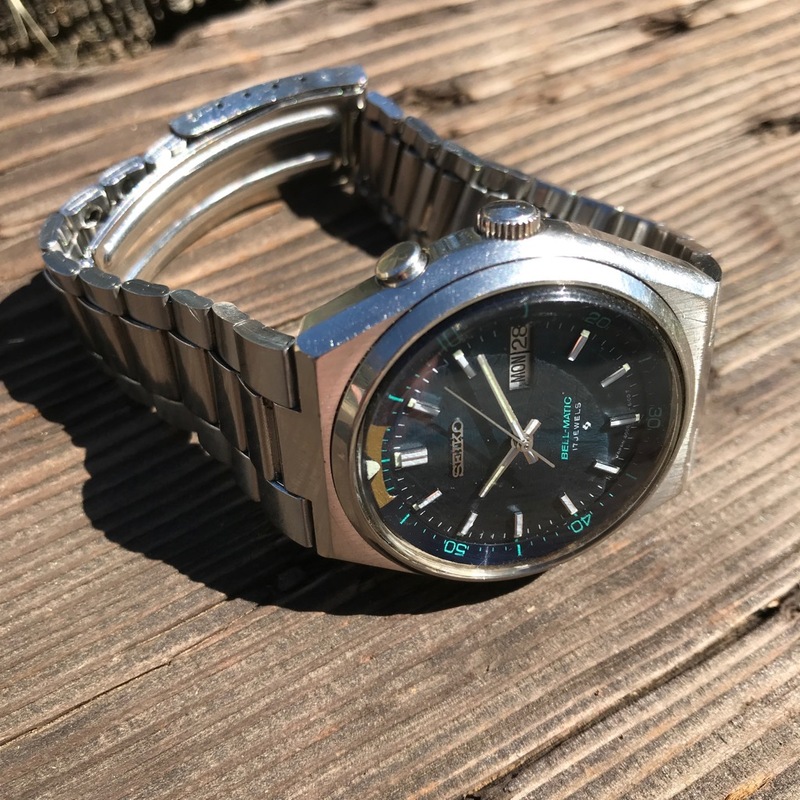 Finding a comprehensive history on the Bell-matic proved difficult, but thanks to some great info on rustmag.com and The Seiko & Citizen Watch Forum I was able to glean some very helpful information for the article. I hope you enjoyed it. Let us know what you think in the comments below, and if you’re interested in acquiring your own Bell-Matic they can be had on eBay for anywhere from $25 bucks for a parts watch, up to and above $400 for a complete, recently-serviced example in excellent condition. Beautiful blue dial. Crystal could use a little cleanup.